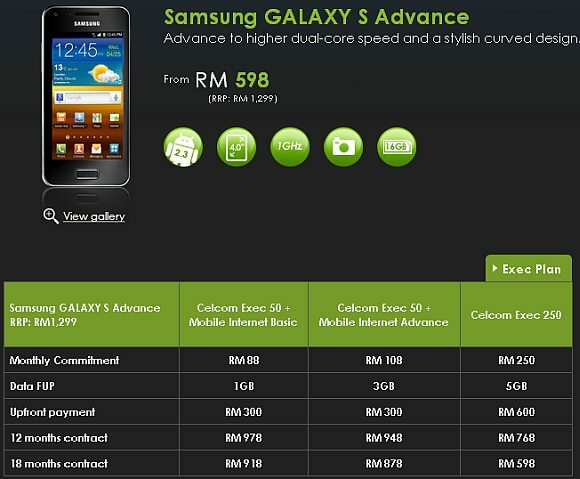 The Samsung Galaxy S Advance that retails for RM1,299 is now available for contract bundling on Celcom. As usual, you have a choice of 3 plans with 12 and 18 months duration. On the highest plan Celcom Exec 250, it goes as low as RM598 with 18 months contract. For those that want to commit less, it can be yours for RM978 with 12 months contract of Celcom Exec 50 with 1GB of data. To recap on the specs, the Galaxy S Advance is dual-core 1GHz Android smart phone with a 4.0″ Super AMOLED display & 768MB of RAM. According to Celcom’s website, the S Advance comes with a 16GB built-in storage while the earlier press release from Samsung Malaysia mentions 8GB. Storage is also expandable via microSD. For more information, head over to Celcom.